The service usually lasts from one to one-and-a-half hours, ending well before noon. We cover the whole spectrum. A few men wear ties and others of us go with the T-shirt and jeans look. But most of us wear what can be described as "business casual." We're not going to judge you by what you're wearing. Are your facilities handicapped accessible? Yes. The sanctuary (worship center) is on the second floor level, but it is accessible by elevator. The education building has two entrances that do not involve the use of steps: along the Garrison Street sidewalk and from the alleyway that runs between the building and the playground. The elevator is located around the corner from the coat rack inside the parking lot entrance. There is a handicap accessible restroom across from the main office on the first floor of the education building. Is it OK to sit anywhere? Is it all right to bring children to worship services? Yes, but you may find that some younger children are not ready for the worship experience. We have child care available in the nursery for this reason. There is a point in the service before the sermon when grade-school children are given the opportunity to leave the sanctuary and go to supervised activities designed especially for them. Do I have to say anything during the service? You won't have to stand up and say anything by yourself. We do have some unison call-and-response pieces as well as some singing, but participation is not necessary. Will I be able to share requests for prayer? There are cards in the pew racks which you may use to write any joys or concerns you have. Just drop it in the offering plate as it goes by, and we will pray for your requests later on in the service. How do you do communion? We celebrate communion at every service. Worshippers are invited to come forward, break off a piece of bread from the loaf, dip it in the cup, and partake. We use grape juice instead of wine. Do you take up a collection? There is an opportunity to give an offering, which is used to support the work of the church in spreading the Good News and helping those in need. As our guest, you are welcome to give, but that is certainly not an expectation. No one will think badly of someone else who chooses not to give. It is certainly not a requirement, but most of our members actually find that regular worship is a very meaningful part of their spiritual lives. People who are unable to make that kind of a commitment are still absolutely welcome to participate when they are able. 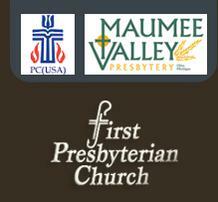 What does it mean that you call your church Presbyterian? Presbyterians are part of a worldwide family of believers who trace their origins back to a sixteenth century movement to renew the church known as the Protestant Reformation. For more information about what Presbyterians believe and how we practice our faith, click here and follow the various links. Are there any special requirements that I have to meet in order to participate in any portion of the service? No. Christianity is for everybody and you will not be excluded because you do not believe in a certain creed or are not a member of the church. However, out of respect, we would ask anyone who does not profess a faith in Jesus Christ to refrain from participating in communion. How many people are at the service? Are you so big that I'll feel lost? We don't think so. We think ours is an excellent size for a church--large enough to offer quality ministries, but small enough to feel like family. We're a friendly group, and it's important to us that you feel welcome. Will somebody call on me (or us) after we visit? We try to make contact with first-time worshippers by mail. The pastor is always available to make visits, but no one will ever come to see you without making prior arrangements and scheduling a time that is convenient. Can I just visit without joining the church? Of course. You may participate in any activity of the church without becoming a member. If you've thought about attending a service at First Presbyterian, you might have questions about what to expect (or what would be expected of you). Here are answers to some common ones. If you have other questions or concerns, feel free to go to the "contact us" page and send us an email.